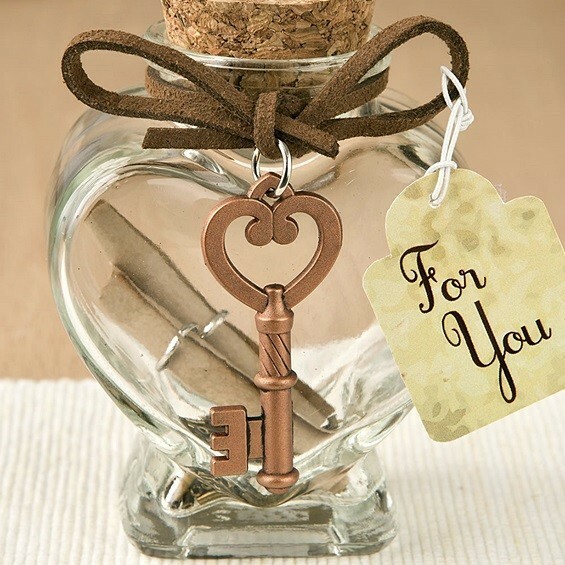 Dimensions: 3 1/4" x 2 3/8" x 2 3/8"
This unique glass heart-shaped favor jar features a cork-topper to secure the brass metal shaving accent pieces and two blank parchment scrolls that are included inside. Write your personal greeting on one of the scrolls and prompt your guests to write best wishes or marriage advice to the newlyweds on the other. Even better, the lip of the jar is wrapped with a leather ribbon and an attached copper-colored-metal, heart-topped skeleton key charm. The presentation is finished with a coordinating "For You" hanging tag. Sold individually. Bulk-packed.